A page from a journal of modern experimental physics will be as mysterious to the uninitiated as a Tibetan mandala. Both are records of enquiries into the nature of the universe. In The Tao of Physics (1975), 36. A research journal serves that narrow borderland which separates the known from the unknown. Editorial, Vol. 1, Part 1, in the new statistics journal of the Indian Statistical Institute, Sankhayā (1933), as quoted and cited by MacTutor webpage for Mahalanobis. Also reprinted in Sankhyā: The Indian Journal of Statistics (Feb 2003), 65, No. 1, xii. I have always felt that I understood a phenomenon only to the extent that I could visualise it. Much of the charm organic chemical research has for me derives from structural formulae. When reading chemical journals, I look for formulae first. From Design to Discovery (1990), 122. I have no trouble publishing in Soviet astrophysical journals, but my work is unacceptable to the American astrophysical journals. Quoted in Anthony L. Peratt, 'Dean of the Plasma Dissidents', Washington Times, supplement: The World and I (May 1988),197. If in the citation of work that we have both done together only one of us is named, and especially in a journal [Annalen der Chemie] in which both are named on the title page, about which everyone knows that you are the actual editor, and this editor allows that to happen and does not show the slightest consideration to report it, then everyone will conclude that this represents an agreement between us, that the work is yours alone, and that I am a jackass. Letter from Wohler to Liebig (15 Nov 1840). In A. W. Hofmann (ed. ), Aus Justus Liebigs und Friedrich Wohlers Briefwechsel (1888), Vol. 1, 166. Trans. W. H. Brock. In a scientific journal, a major consideration is whether the book reviewed has made a contribution to medical science. Cynics may well say that they know of no psychiatric text that would meet such conditions, and they may be right. In book review by Myre Sim, about 'Ending the Cycle of Abuse', The Canadian Journal of Psychiatry (May 1997), 42:4, 425. 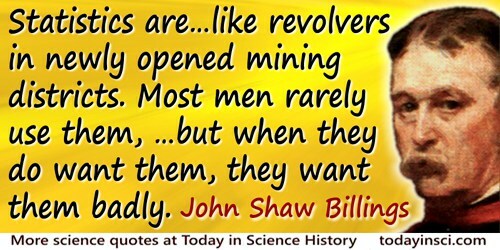 Statistics are somewhat like old medical journals, or like revolvers in newly opened mining districts. Most men rarely use them, and find it troublesome to preserve them so as to have them easy of access; but when they do want them, they want them badly. 'On Vital and Medical Statistics', The Medical Record, 1889, 36, 589. The history of the word sankhyā shows the intimate connection which has existed for more than 3000 years in the Indian mind between ‘adequate knowledge’ and ‘number.’ As we interpret it, the fundamental aim of statistics is to give determinate and adequate knowledge of reality with the help of numbers and numerical analysis. The ancient Indian word Sankhyā embodies the same idea, and this is why we have chosen this name for the Indian Journal of Statistics. Editorial, Vol. 1, Part 1, in the new statistics journal of the Indian Statistical Institute, Sankhayā (1933). Also reprinted in Sankhyā: The Indian Journal of Statistics (Feb 2003), 65, No. 1, xii. The physics of undergraduate text-books is 90% true; the contents of the primary research journals of physics is 90% false. In Reliable Knowledge: An Exploration of the Grounds for Belief in Science (1978, 1991), 40. As quoted in Ted Goertzel, et al., Linus Pauling: A Life in Science and Politics (1965, 1995), 46. To the solid ground Of Nature trusts the mind which builds for aye. From Sonnet 36, Poetical Works (1827), Vol. 2, 290. Reference to masthead from nature.com website.